Lanzarote, an Island in the Atlantic Ocean, is one of the Spanish Canary Islands. It is located just off the coast of West Africa. 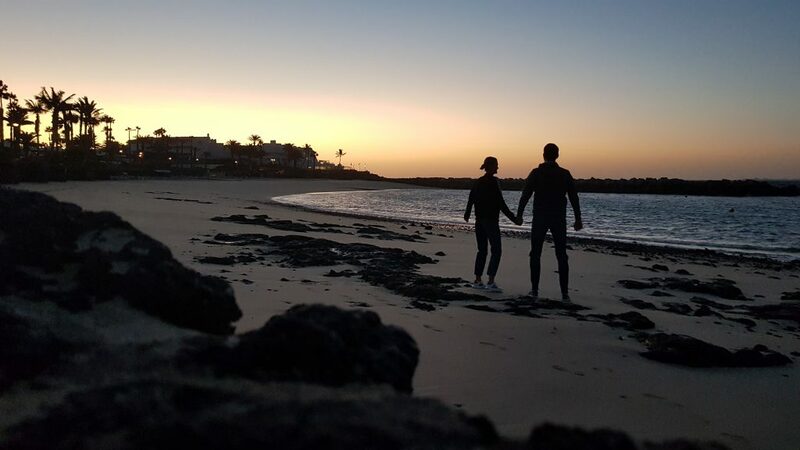 Due to its year-round warm weather and many attractions, Lanzarote is a very popular winter destination – you will definitely find plenty of things to do in Lanzarote! 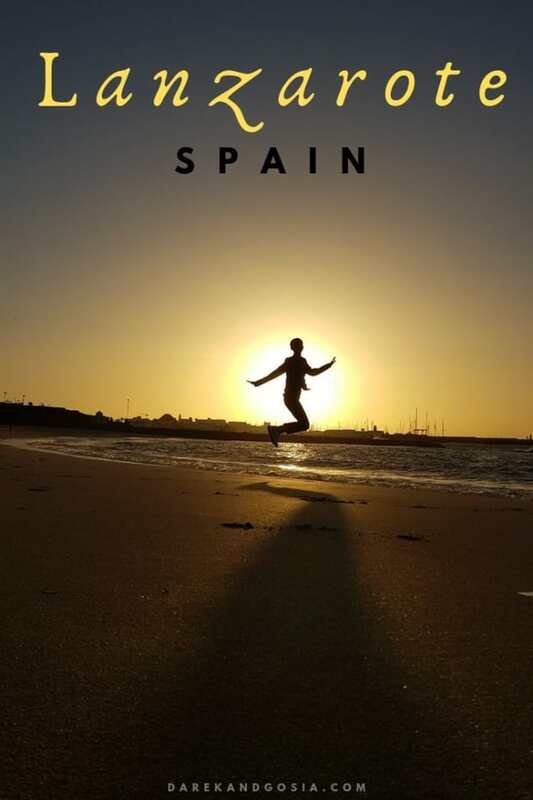 This intriguing island, with extraordinary views and beautiful places to visit, should be on any Spanish bucket list. 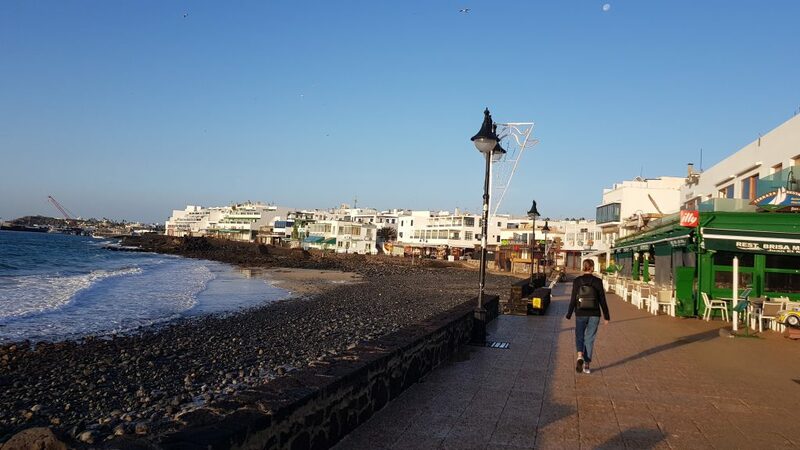 If you are interested in: what to visit, what to see or what’s the weather like in December – please read our guide to the top attractions in Lanzarote. 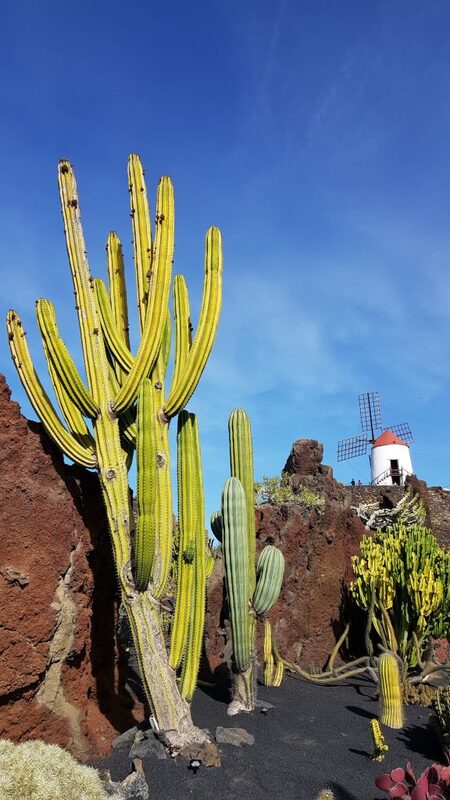 Jardín de Cactus, known as Cactus Garden, located in a tiny town of Guatiza (municipality of Costa Teguise) in the north-eastern part of Lanzarote. I guess you will not be surprised if we tell you that you will find cactus inside the garden 😉. In fact, there are over 1,400 species of these plants! From tiny, measuring just a few centimetres, to some real giants. Many of the cactus in the Jardín de Cactus are from the Canary Islands, but there are also few from around the world (including Mexico, Chile or Morocco). The whole garden is very well designed. After exploring and taking pictures of the plants, you can relax at the restaurant. You can even try a cactus burger if you fancy 😉. 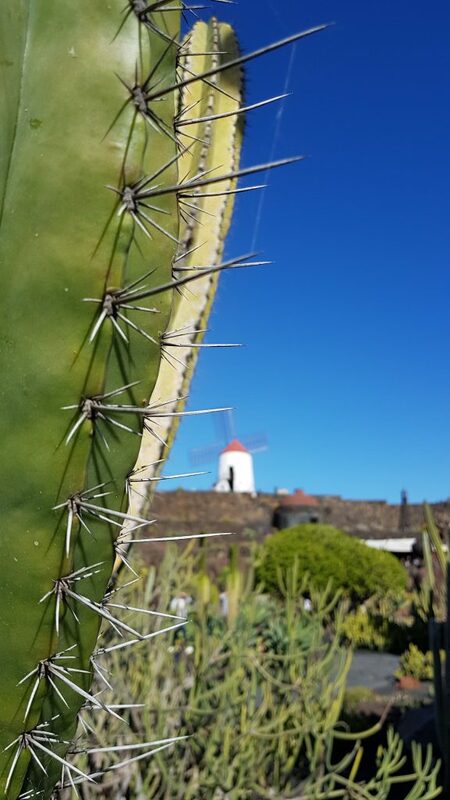 Completing your trip to Cactus Garden, you can claim on former windmill from the eighteenth century, which is located just above the restaurant. 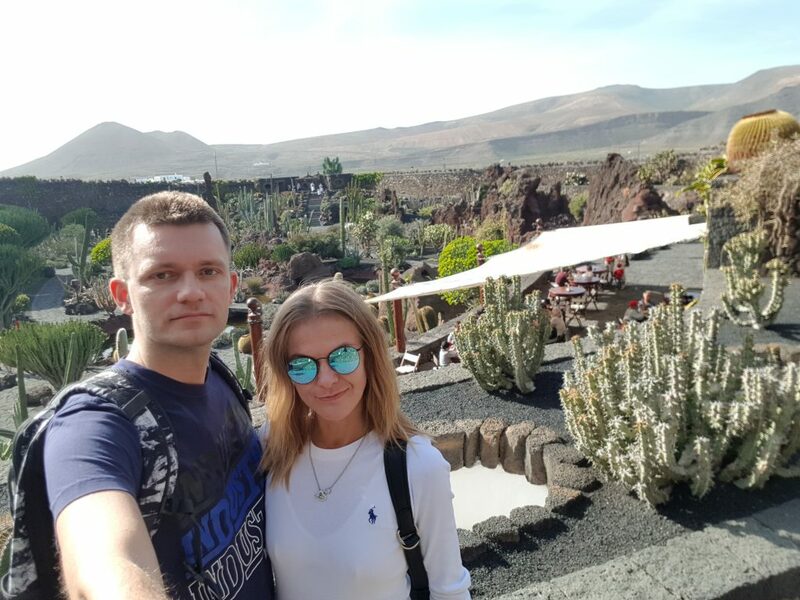 So, is Jardín de Cactus one of the best things to do in Lanzarote? 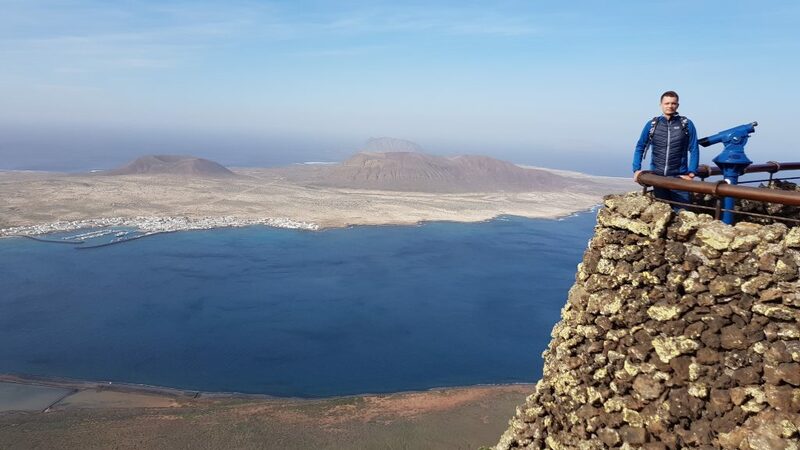 The Mirador del Rio viewpoint is located over a cliff (at 475m height) at the very north of the island of Lanzarote. 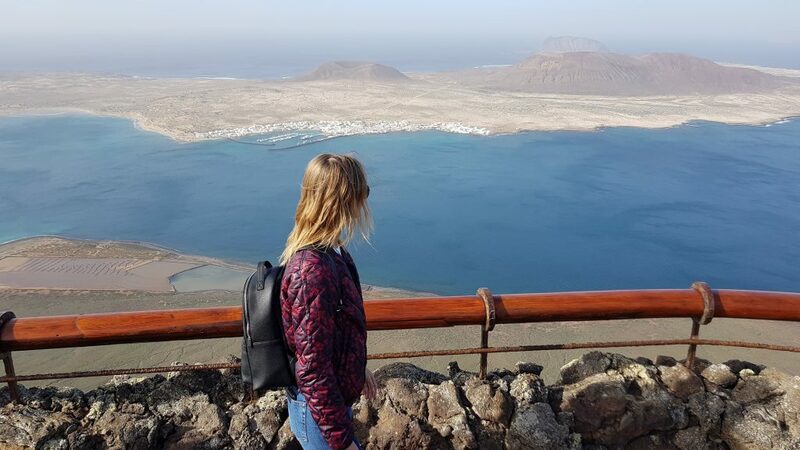 Mirador del Rio offers one the best view in Europe – the marvellous panorama covers the neighbouring island of La Graciosa and the breathtaking bay of El Rio. 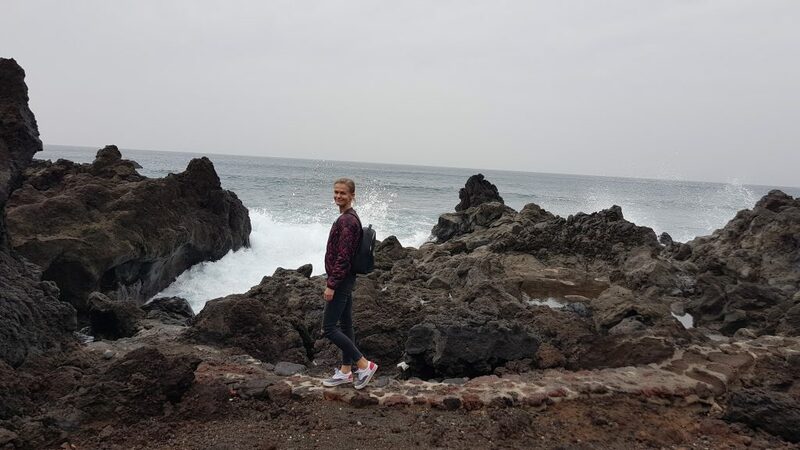 The viewpoint on Mirador del Rio was designed by the famous designer of the Canary Islands Cesar Manrique. There is also a souvenir shop and a café-restaurant with an amazing view through its windows. 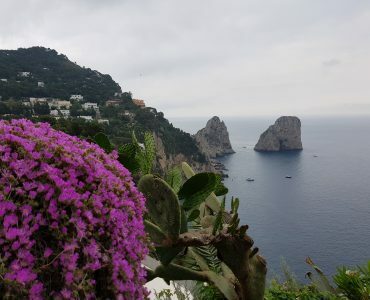 But the real gem is the viewpoint located on the roof of the restaurant – we absolutely loved it! 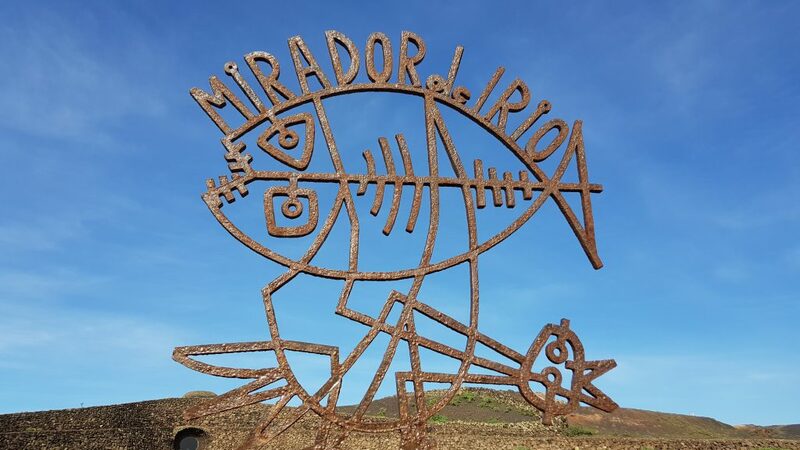 Mirador del Rio is a must-visit place while on the island! 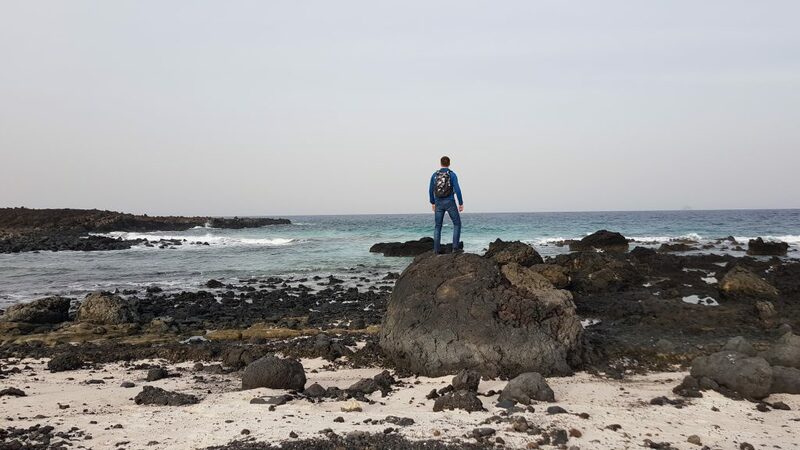 Black lava rocks, turquoise Atlantic water and white sand make Caleton Blanco one of the top spots to visit on Lanzarote. 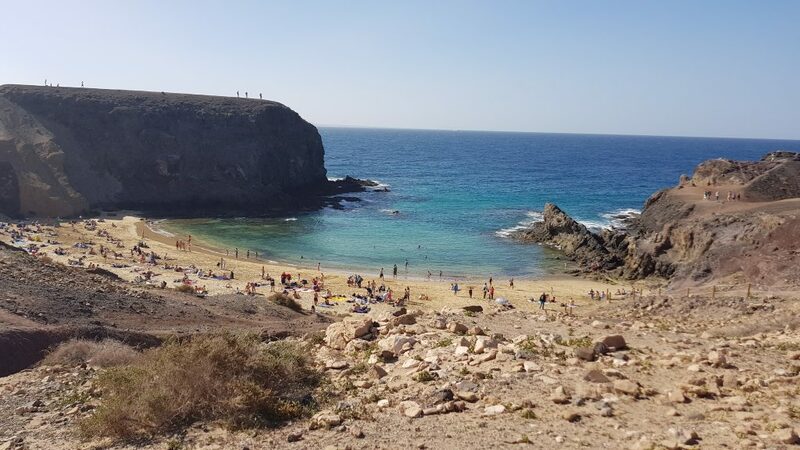 It is located in the north part of the island, not far from Órzola, and easily access it by a car after visiting Mirador del Rio. Yes, it is a bit away from everywhere else but well worth the trip! The scenery on the way there is beautiful! You will be impressed with the gorgeous white sand beach when you arrive. 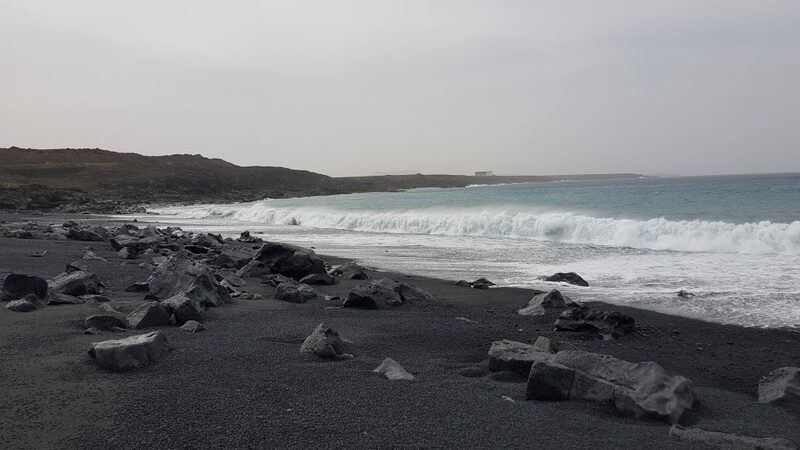 The contrast between the black lava stone and the partly very white sand is just stunning! You can even relax in one of the “windburgers”, in case you have to hide from a strong wind 😊 The surreal landscape and views will definitely make your stay there a few hours! The landscape here is fantastic! The contrast between the very white sand and the blackness of the rock and mountains makes this place worth to visit. 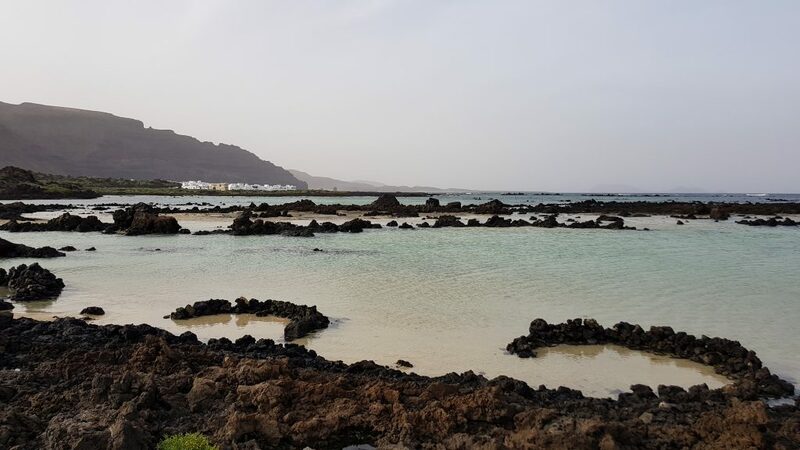 You will probably not spend too much time at Spiral Caleta but make sure you stop for half an hour to admire the stunning views. 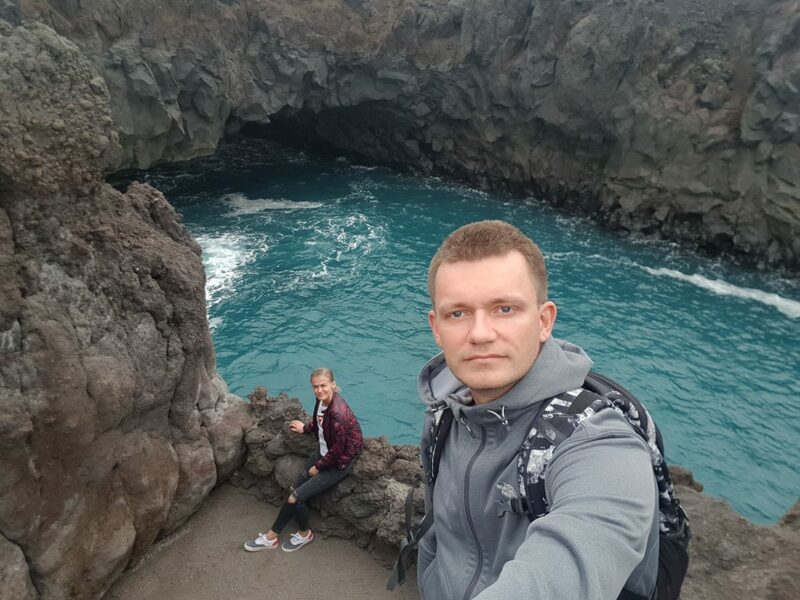 This lava tube is one of the main tourist attractions on the island of Lanzarote. The tunnel, formed by La Corona Volcano, is one of the longest and probably most interesting in the world. So, all cave-lovers should add this to the bucket list. 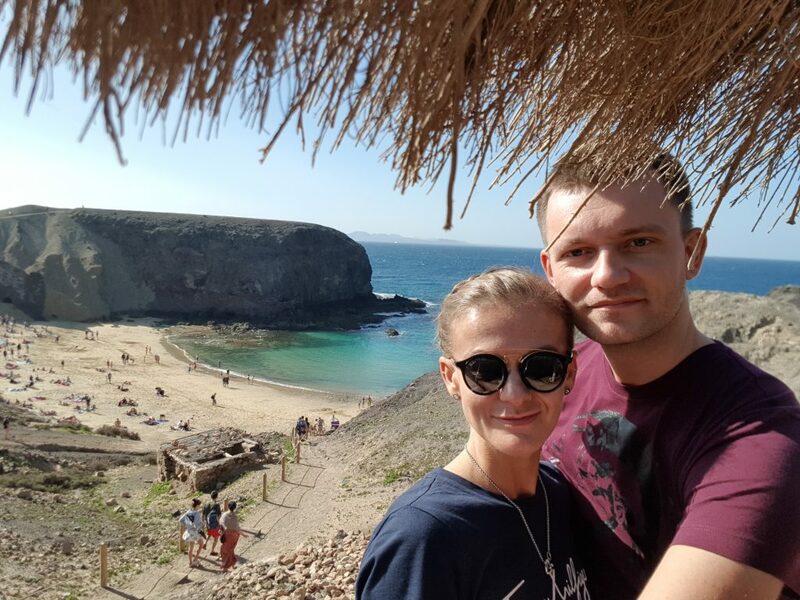 Cueva de Los Verdes can be visited as part of a 1hour guided tour, during which you can learn about the history of Lanzarote and the cave itself. Jameos del Agua, a very original cave, was created as a result of the La Corona volcano eruption 3000 thousand years ago. Hot lava made a long tunnel ending up at the bottom of the Atlantic. Cesar Manrique, who designed this place, transformed several underground chambers into a huge 600-person auditorium with amazing acoustics. 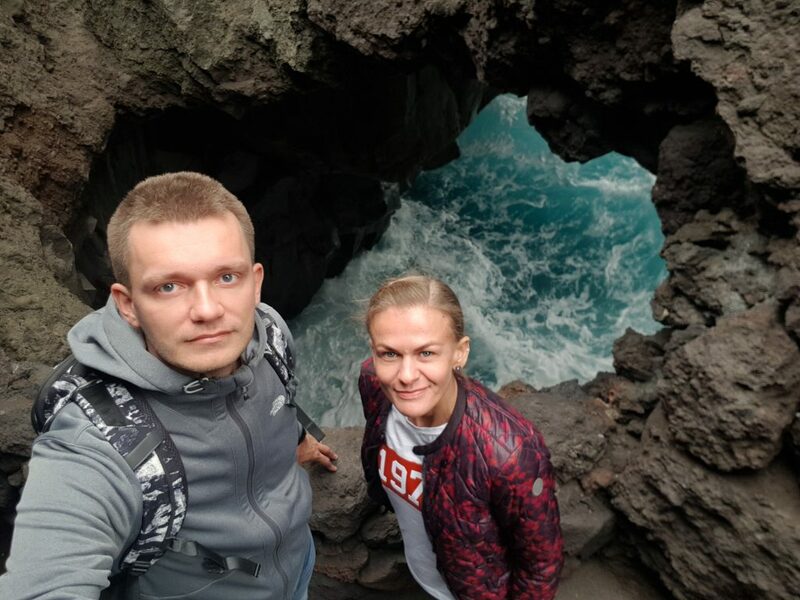 Together with a swimming pool, a tropical garden, an elegant restaurant and a moody nightclub Jameos del Agua became one of the most fascinating attractions on the island is the most-visited place in Lanzarote. There are unique species of albino crab (Munidopsis Polymorpha) in the lake, that occur only in this one place in the world. The crabs are blind and have a white colour. They reach no more than 1 centimetre in length so you have to go closer to the lake’s surface to admire those little crabs. In one of the caves (Jameo Grande), a swimming pool with crystal-clear water and a white bottom was created. The view of the contrasting colours of the surrounding area and the water will stimulate your senses. Unfortunately, you are not allowed to swim in both the swimming pool and lake. 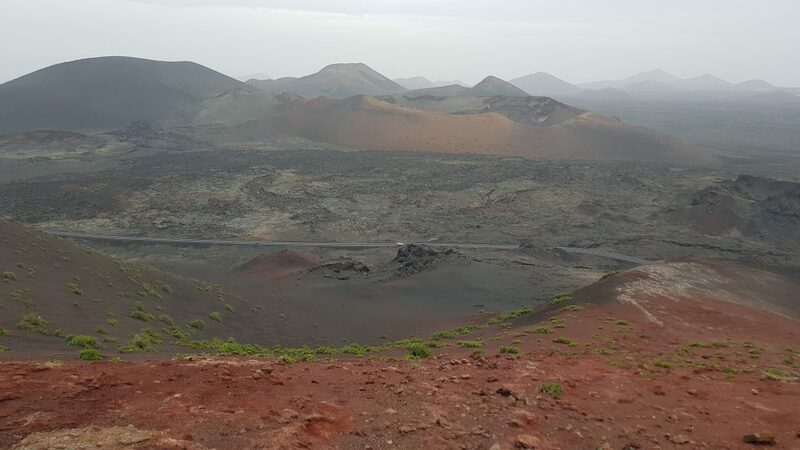 Timanfaya National Park, known as Mountains of Fire, is one of the main attractions on Lanzarote. In fact, more than 1.5 million people visit this park every year! 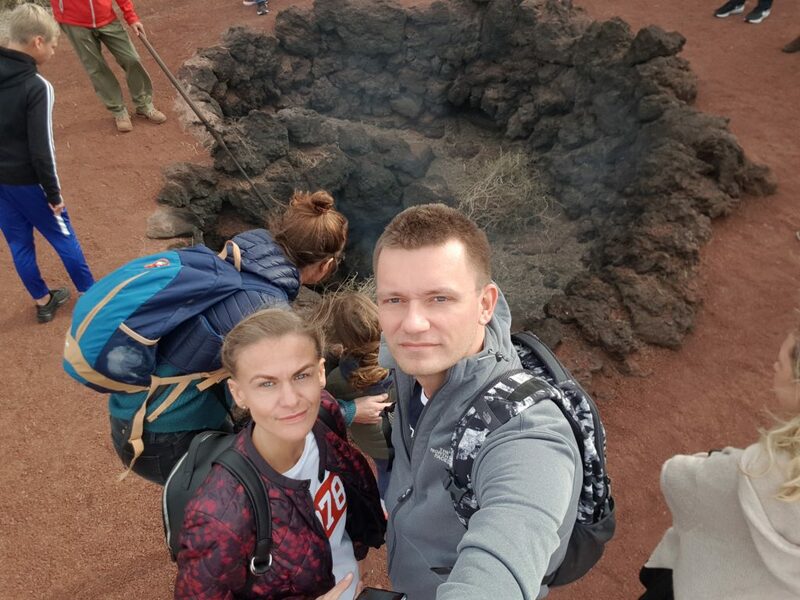 The park was established in 1974 and covers areas where eruptions took place between the 17th and 19th centuries. Here happened the most important volcanic eruptions in the history of mankind in terms of duration and extent. You can watch how park employees are pouring water into holes in the ground, causing the geysers to be launched. Or a magic trick – they threw hay in between the rocks which self-lights up. 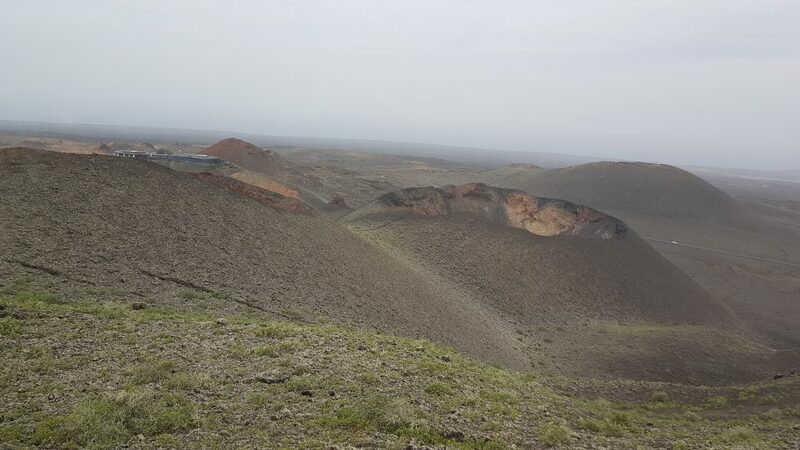 There is no way to explore Timanfaya National Park on your own. It is not possible to move around in the rented car or by foot. 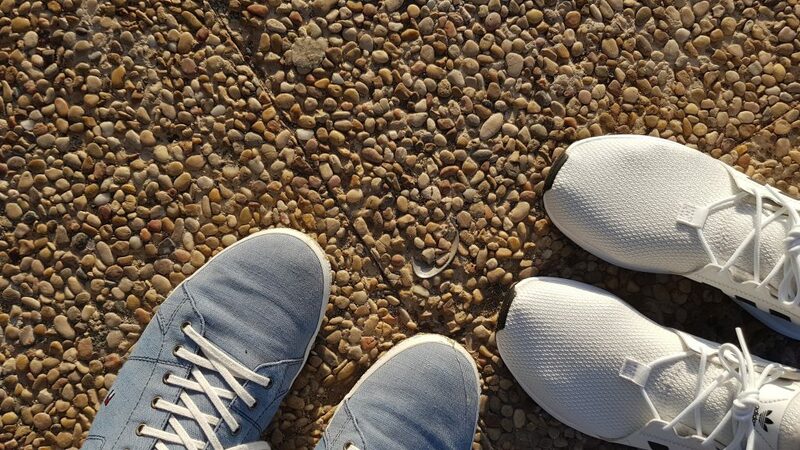 The only exception is the walking route Ruta del Litoral. The Coastal Route, trail no. 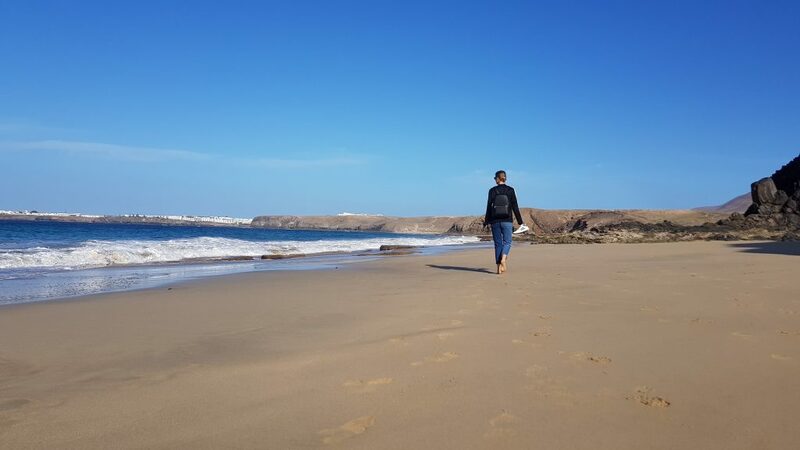 10, is leading from El Golfo to Playa de La Madera. It is 12 km long (one way) and you will need 4 h 30 minutes to complete it – so this is not an option if your time is limited. 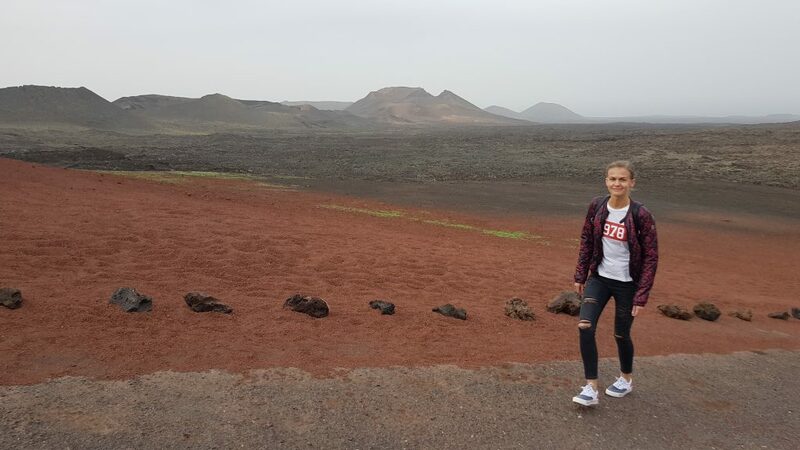 The good news is that you can take the “Ruta de Los Volcanes” by the bus tour. There is no extra charge and the price is included in your €10 entry ticket to the park. 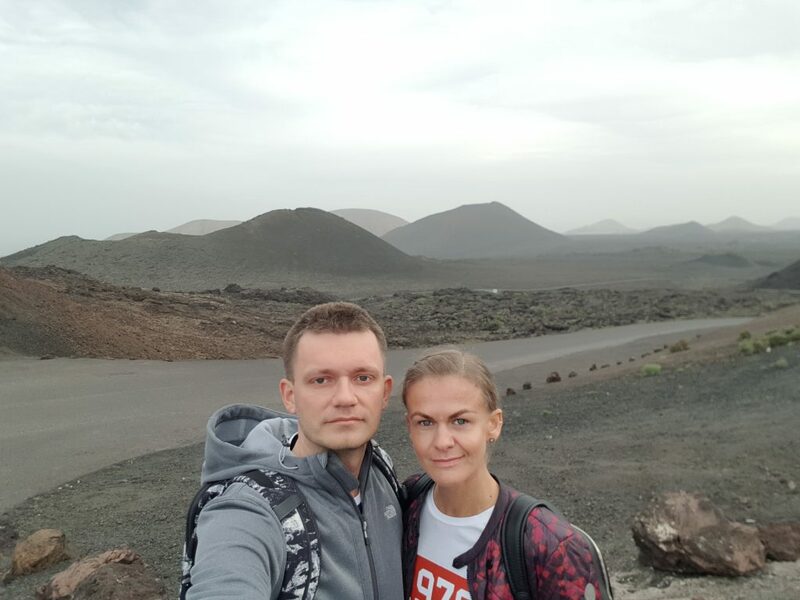 The volcano trail was designed in 1968 by César Manrique and Jesús Soto and allows you to admire the stunning landscape during a 45min long trip. To be honest, we are not big fans of taking pictures through coach windows, as you always get a reflection. Also, the colour of the glass changes the photos but there is no other option to admire those amazing views. Believe me, it’s still worth it! In the place called the Hilary Island, there is also the El Diablo restaurant designed by César Manrique. This characteristic building with a round facade perfectly integrated into the surrounding volcanic landscape. Thanks to a glass wall, you can enjoy the panorama of the Mountains of Fire while having your lunch. 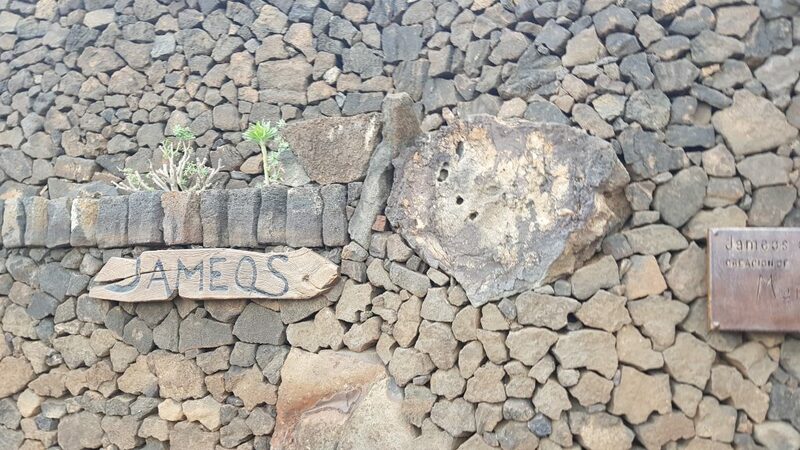 The restaurant itself is made of volcanic stones which looks fantastic. 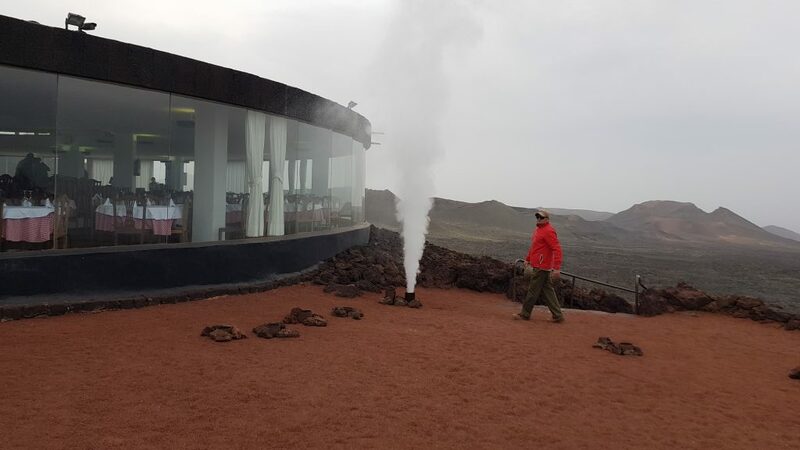 They serve meals roasted on the grill, but not just any… It uses volcanic heat coming out straight from the ground! 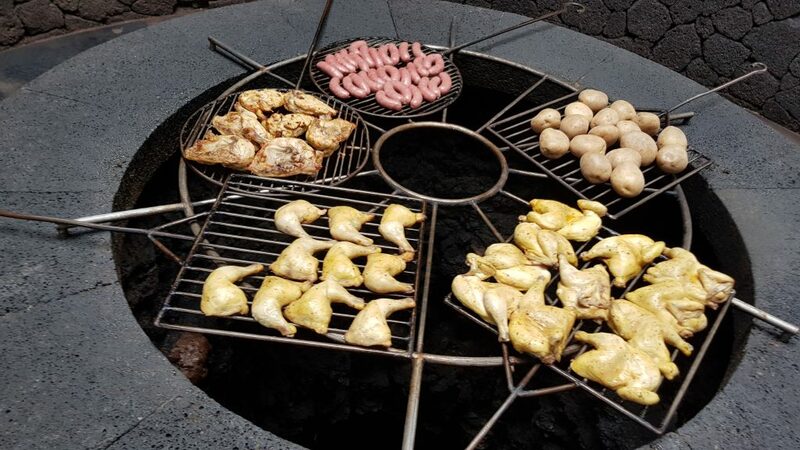 Would you eat something that was grilled on a volcano? 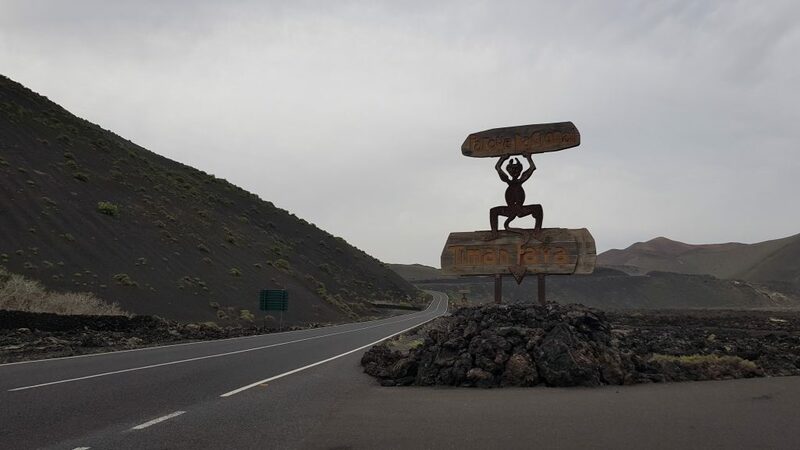 2 kilometres before entering the Timanfaya National Park on the LZ-67 road there is a car park and a small museum. The main attraction here is a 200-meter-long camel tour. The ride takes 15-20 minute while you are sitting on one of the traditional chairs placed on each side of the camel. 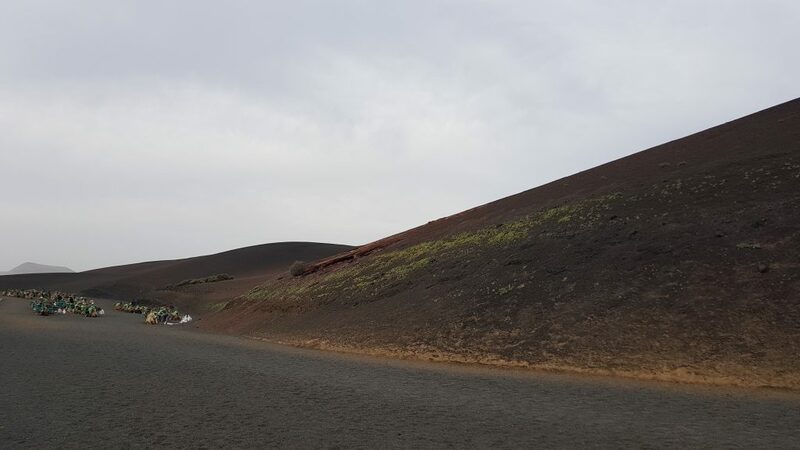 The Ruta de Camellos, as it’s called, is another way to visit the Timanfaya National Park. We didn’t take the ride, as to be honest, we didn’t fancy it after we saw how the park employees were shouting in order to make the camels do what they wanted… But, it’s your call really. The ride will cost you €6 if you decide to do the camel tour. 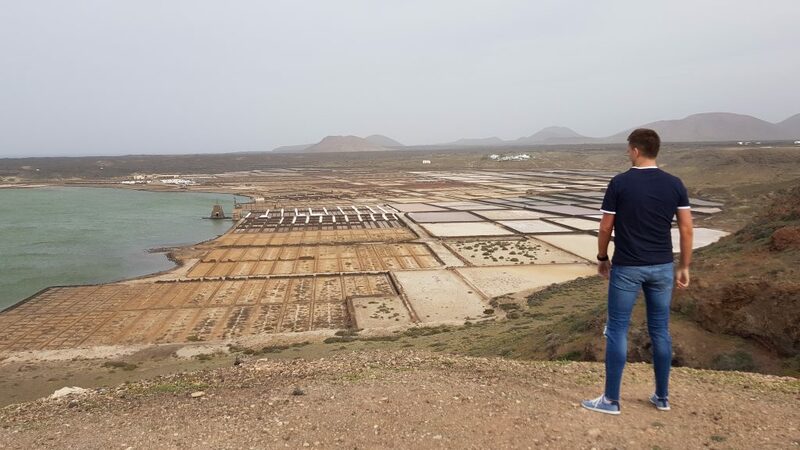 Las Salinas del Janubio is an impressive natural salt factory located by the coastline in the south of Lanzarote. From a viewing point above the salt factory, you can watch the”plots” used to acquire salt. Dozens of clay-stone trusses forming a kind of checkerboard in which the sea water after evaporation leaves a glassy pane of salt. 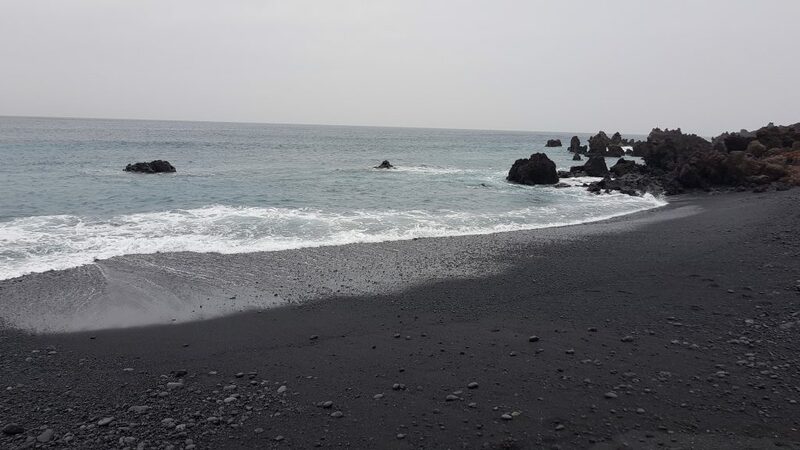 This stunning, stretching just over 800 meters, black-sand beach is located just stone’s throw from the Old Salt factory. And it a must have stop on your way to Los Hervideros! You will have to go off-road to get there, but it shouldn’t take you more than 5-10 minutes. 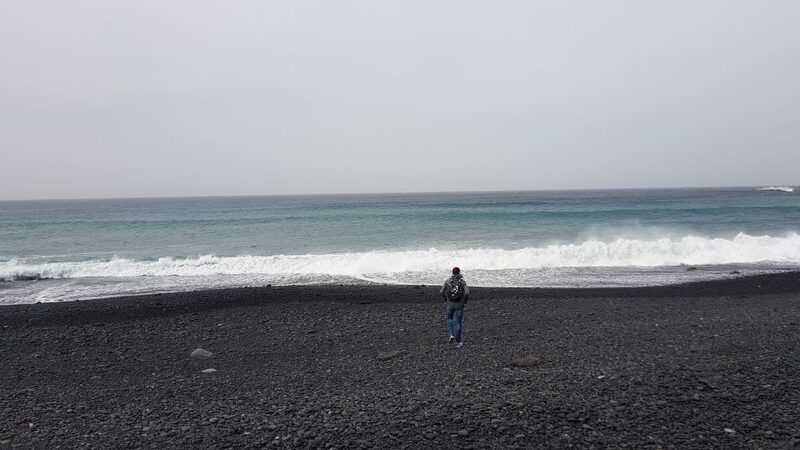 It is worth going for a walk on the black beach – the scenery is just breathtaking and you feel like walking on the Moon! There is always a red flag present, indicating that bathing on the Janubio Beach is dangerous – the current here is very strong. 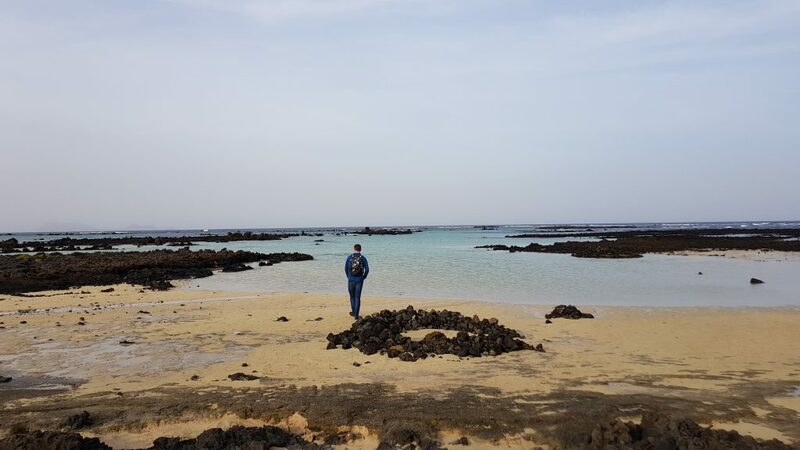 A lot of people will skip this beach which makes it an ideal spot for all looking for a quieter place on Lanzarote Island. Janubio Beach is one of the most interesting beaches to visit, its colour reminded us of the famous Reynisfjara beach in Iceland. 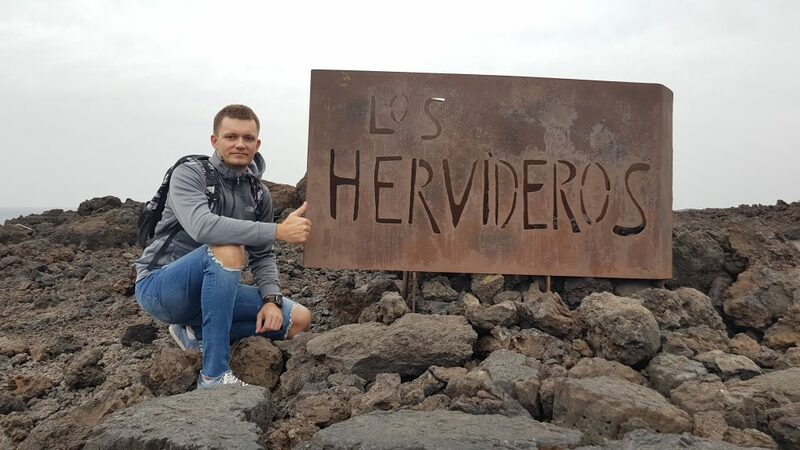 Los Hervideros, known as boiling coast, is a must-visit stop on the LZ-703 road to El Golfo. 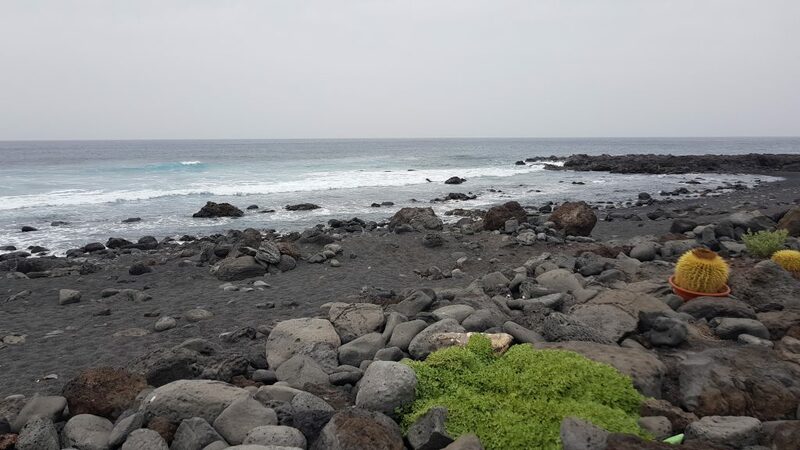 This viewpoint is a fragment of a rugged shore which was created during volcanic eruptions when huge masses of hot lava met with cool sea water. It is a complex of rocks that have formed into specific labyrinths and amazing caves. 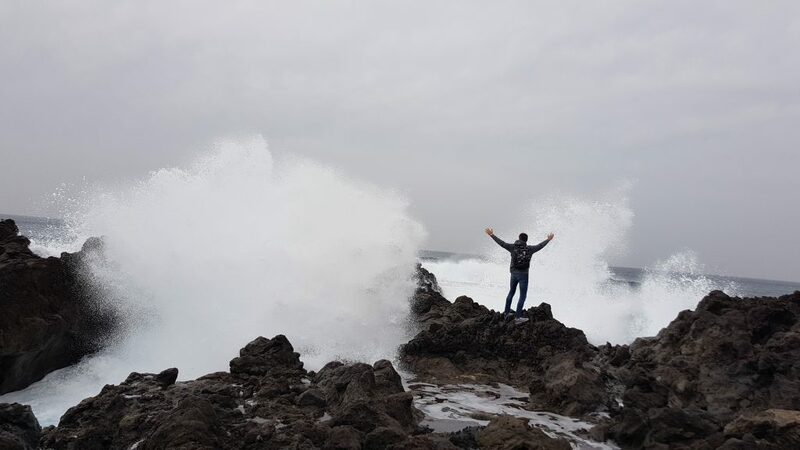 This free attraction on Lanzarote is really spectacular – a reminder of nature’s power and beauty! Best to visit on a windy day when the masses of sea-water flowing into the caves creating beautiful “performance“. All you have to do is just stand and admire this awesome spectacle. 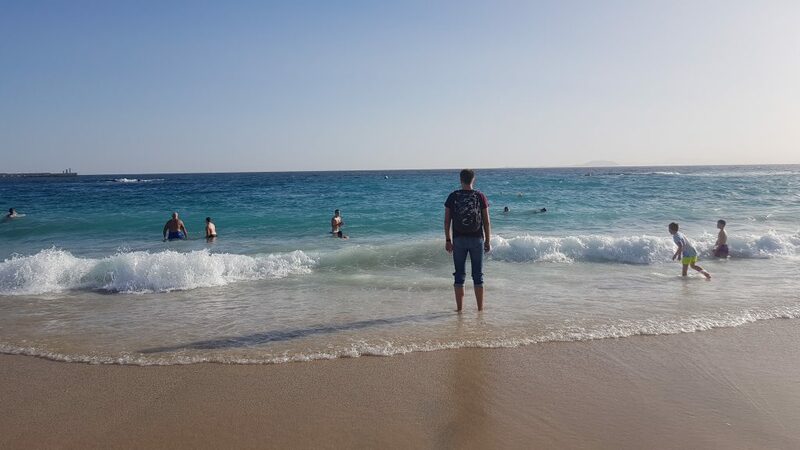 Playa de Montaña Bermeja, at about 400m length, is a bit shorter than the Janubio Beach – but it is also very impressive! 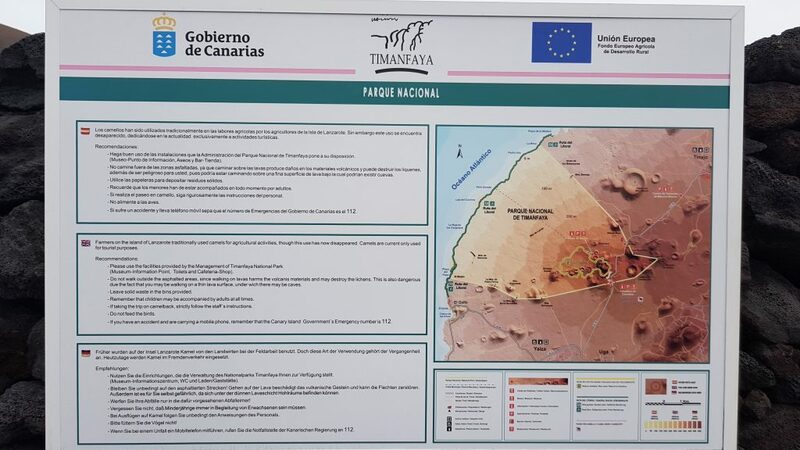 It is located on the way to El Golfo so be ready that the car park will be full. But no worries, there will plenty of space. 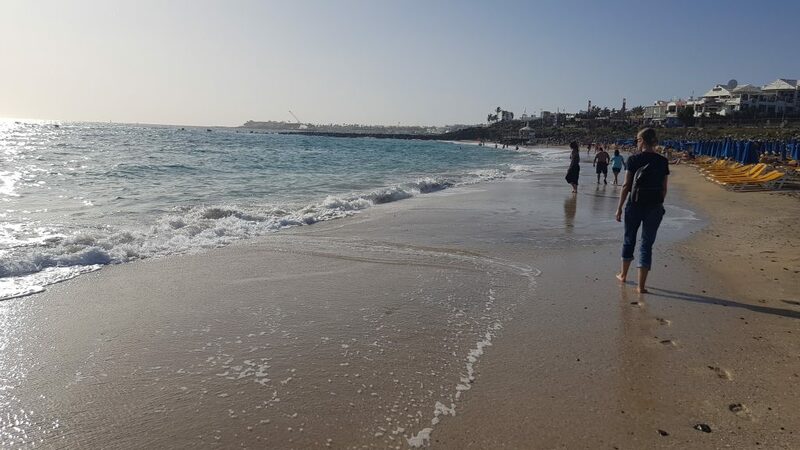 The current is very strong on the beach, so you will not be able to take a swim there as it’s highly recommended to not enter the water. But this shouldn’t stop you from visiting Playa Montana Bermeja! 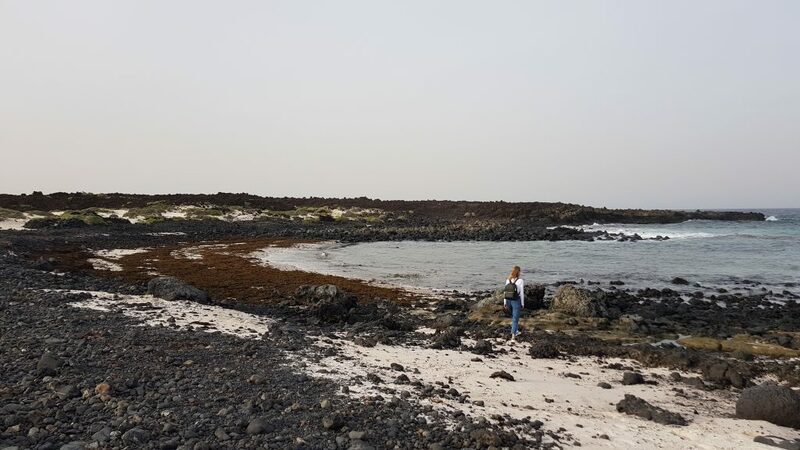 You can still have an amazing time on the beach by taking a walk and observing little crabs hiding in the rocks and cliffs. 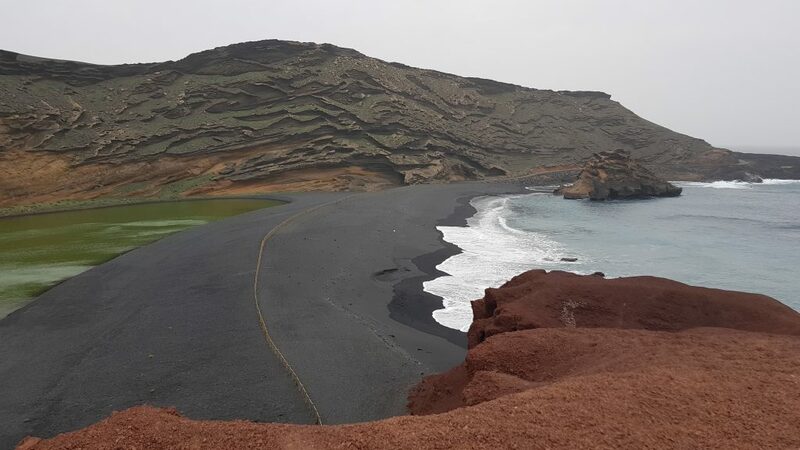 There is also a mini lake, between the sea and the road, which combines with the red mountain & black beach creates spectacular scenery. 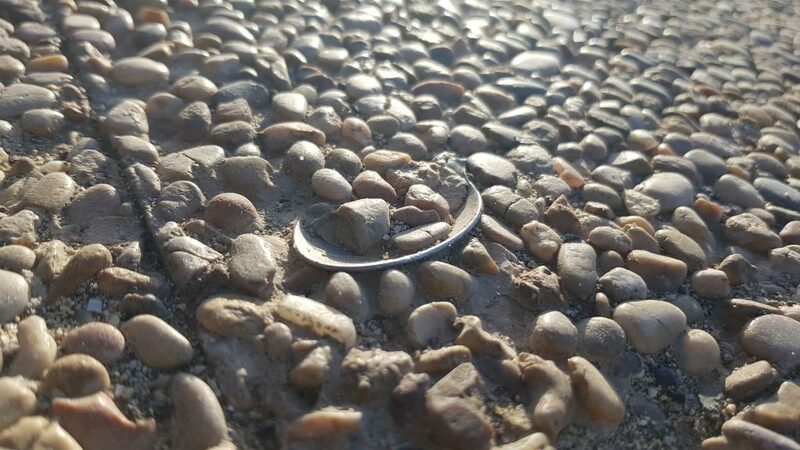 Make sure you park your car at the end of the El Golfo town. So, you can walk and enjoy the stunning coastline – make sure to take a few pictures there. 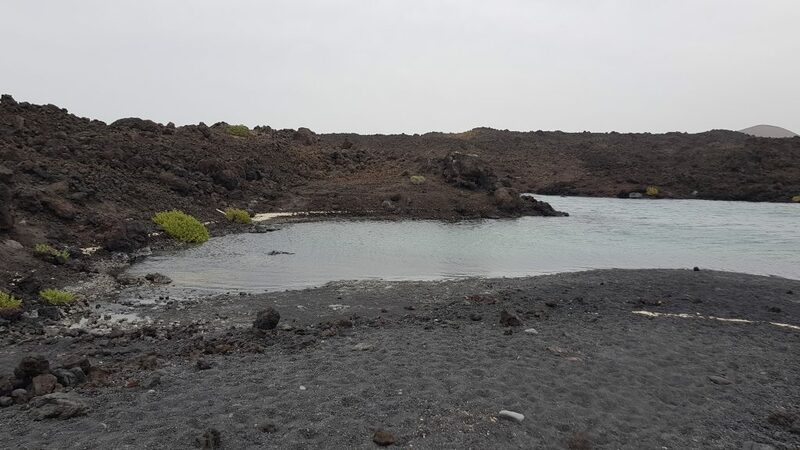 Charco de Los Clicos (Charco Verde) is another place of the most visited tourist attractions on Lanzarote. 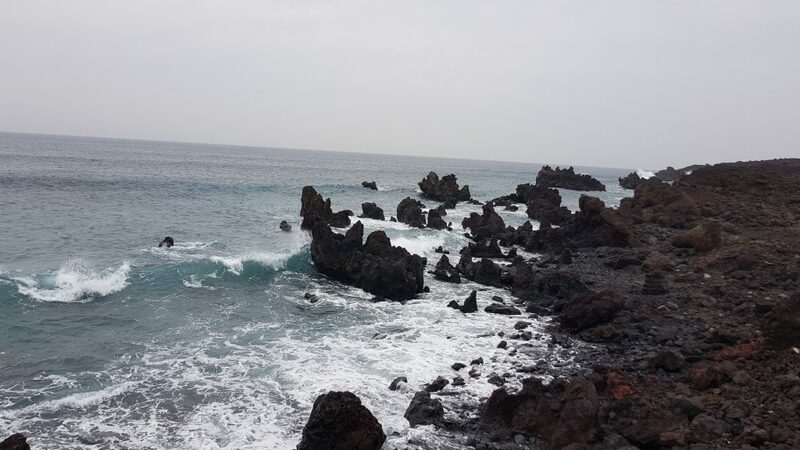 It is located in Elf Golfo, on the south-west coast of the island. The Green Lagoon, approx. 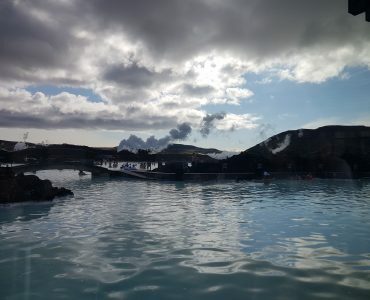 10 m deep, is a natural lagoon powered by sea water. 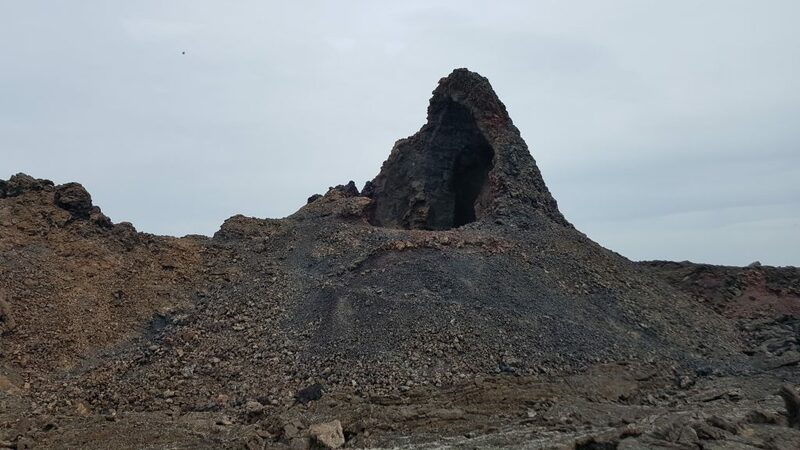 It was created as a result of the volcano El Golfo in the eighteenth century. There is a viewing point which you can reach by foot. 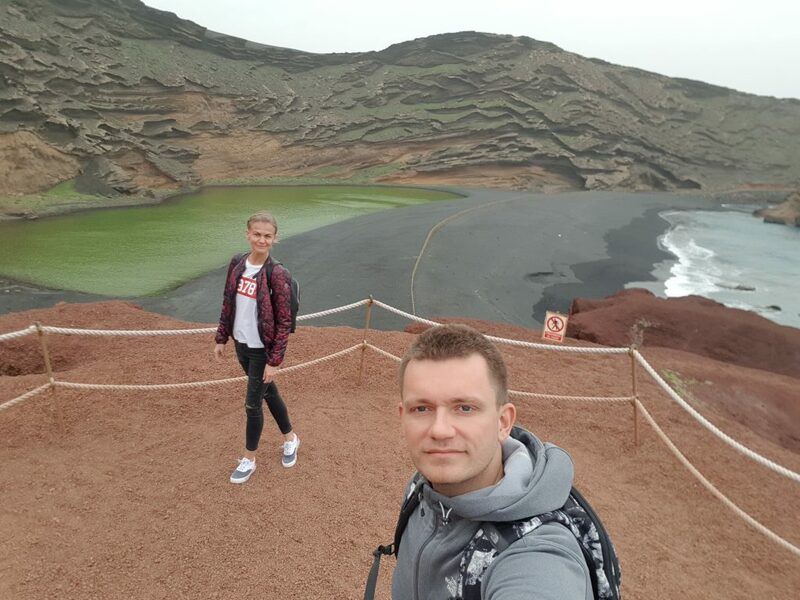 From there you will get an impression that you see a lake in the middle of the black beach. 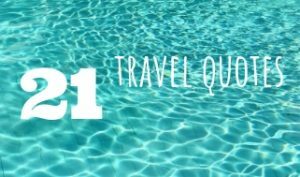 But Charco de Los Clicos is not a lake! 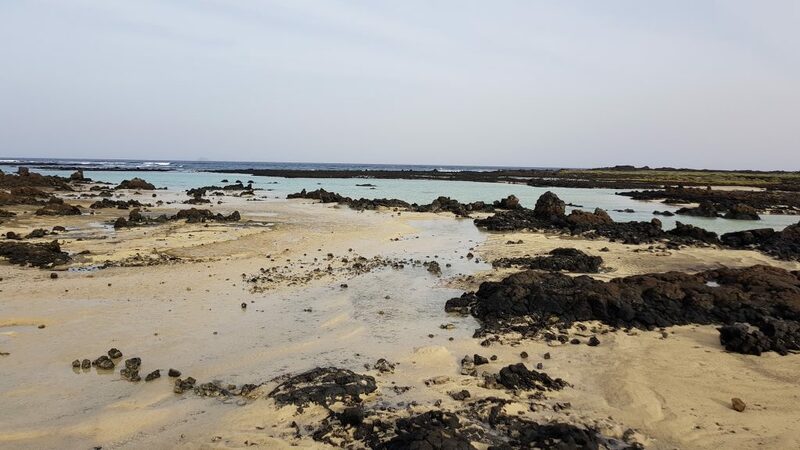 In fact, it is a volcanic crater washed up by the sea. The lagoon has its very intense, bright green colour due to algae living in the tank. 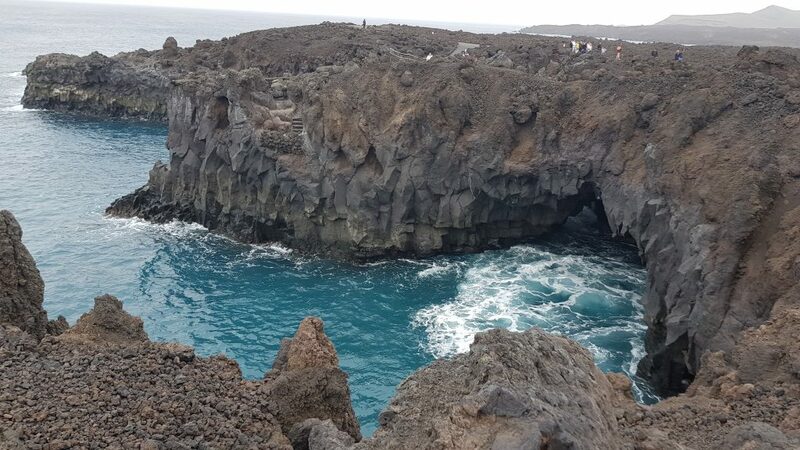 This creates incredible scenery as it contrasts with the surrounding black lava and orange rocks. 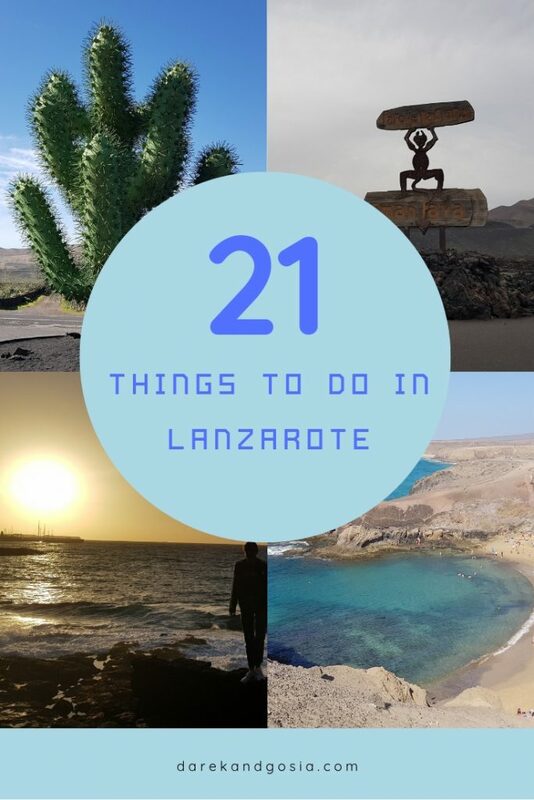 A must have on your list of things to do in Lanzarote! This was the closest beach to our hotel 😊 It’s a nice little sandy beach sheltered by manmade breakwaters. It’s a perfect place to watch the sunrise! There are a few restaurants, so you can enjoy an evening meal, have a cocktail and watch the sea. 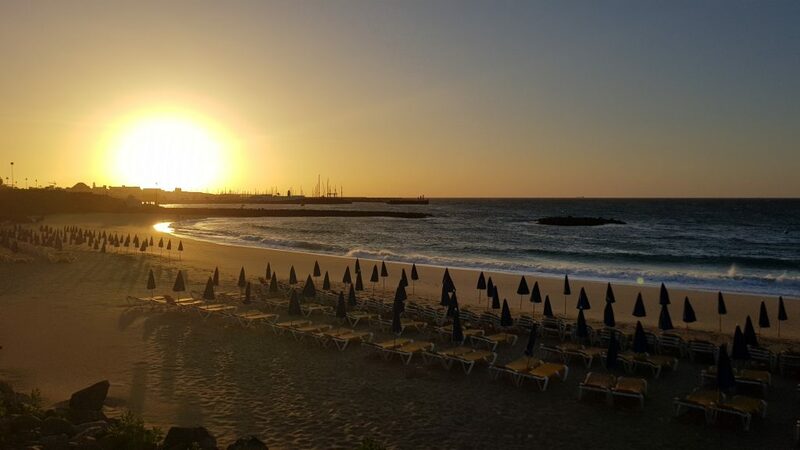 It’s well worth to take a trip to Playa Flamingo if you are based in the south of Lanzarote. 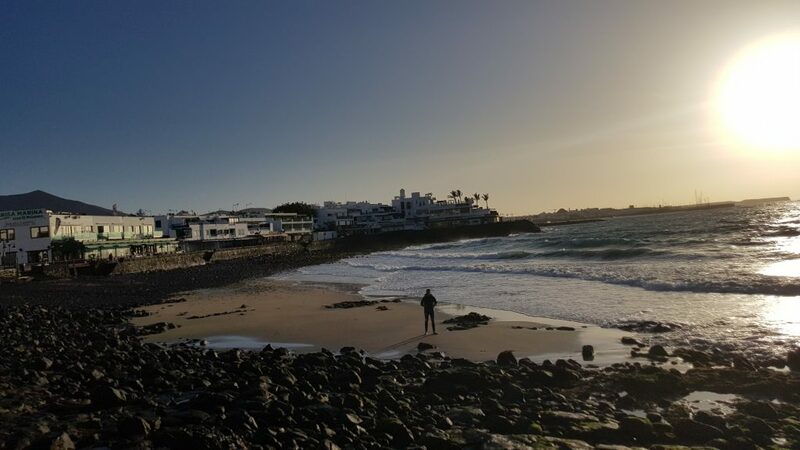 Playa Blanca, which in Spanish means “White Beach” is a town beach of Playa Blanca – the most Southerly resort on Lanzarote Island. The beach is not big and when the sea level is high, it might completely disappear! 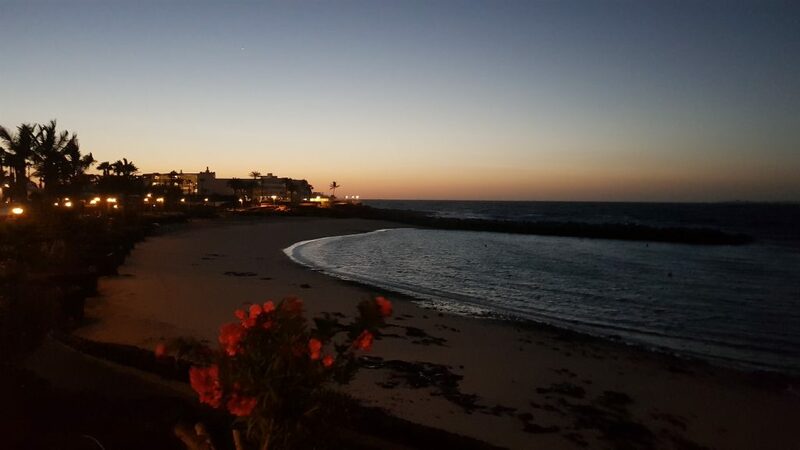 Playa Blanca with its golden sand and calm waters offer good conditions for diving and plenty of restaurants, with terraces overlooking the sea, make this spot ideal to spend there a whole day. 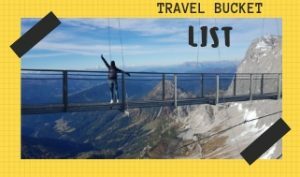 Would you add this to your bucket list? 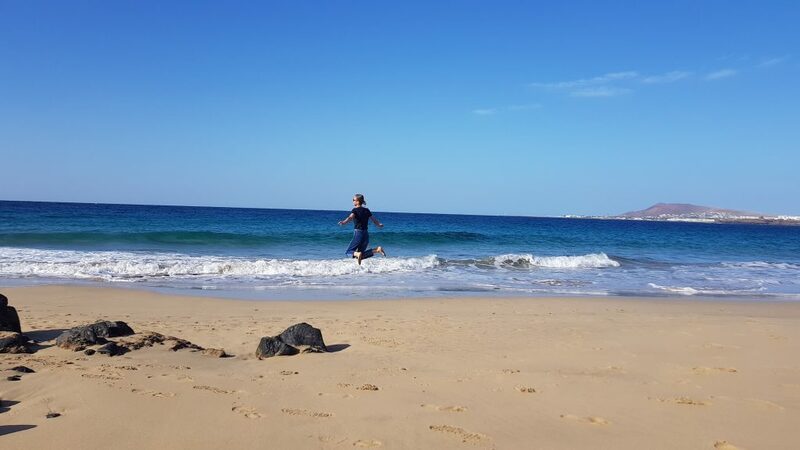 Playa Dorada with Golden sand and crystal-clear water is one of the nicest manmade beaches in Lanzarote. There a plenty of restaurants and little cafes so you can enjoy tapas from a bar area overlooking the sea. 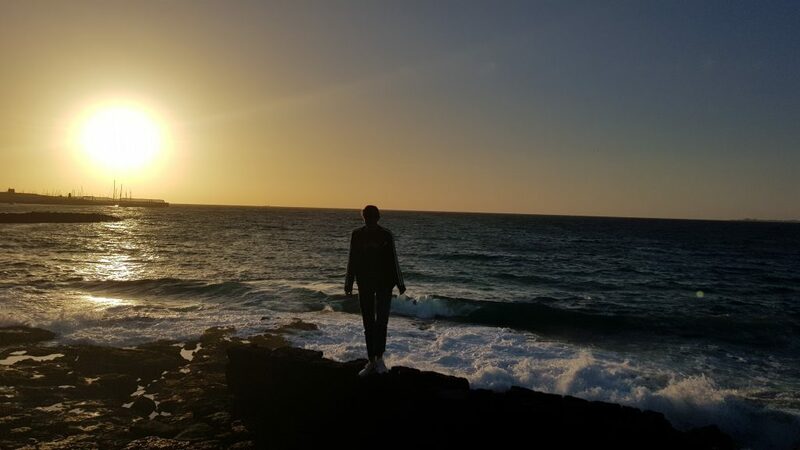 We visited the beach early morning to watch the sunrise as well as the sunset in the evening. A perfect place to relax any time of the day! La Cera beach is located just next to the very popular beach of Playa de Papagayo. It is also one of the six beaches of Papagayo. We absolutely loved that golden sandy beach. It is surrounded by many cliffs, which create a spectacular landscape. Where you are on the beach or watching it from the above cliffs – you will love this unspoilt and natural beach. 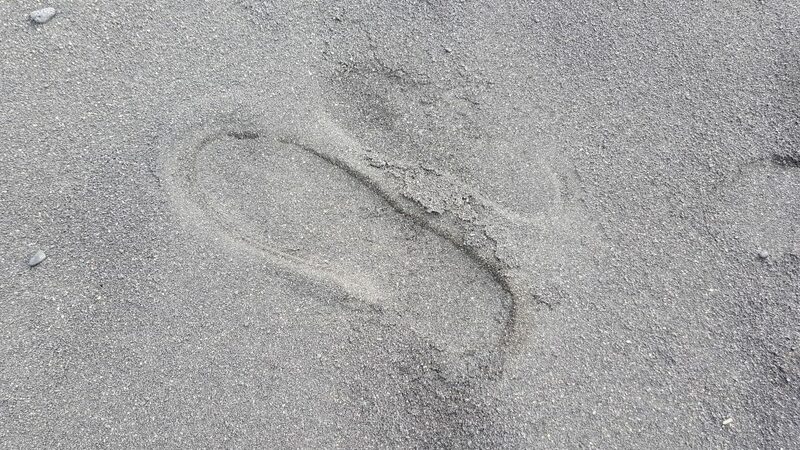 During low tide, you will have the chance to walk from La Cera beach to the other beaches on the northern side. On your way, you will find many small coves tucked between the cliffs – a perfect place to relax. 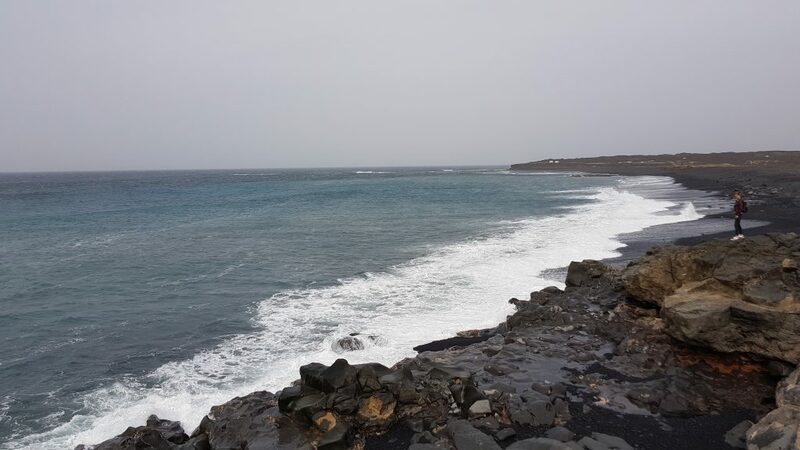 If you continue walking you will get to other beaches such as Playa de las Ahogaderas or Playa de las Coloradas. 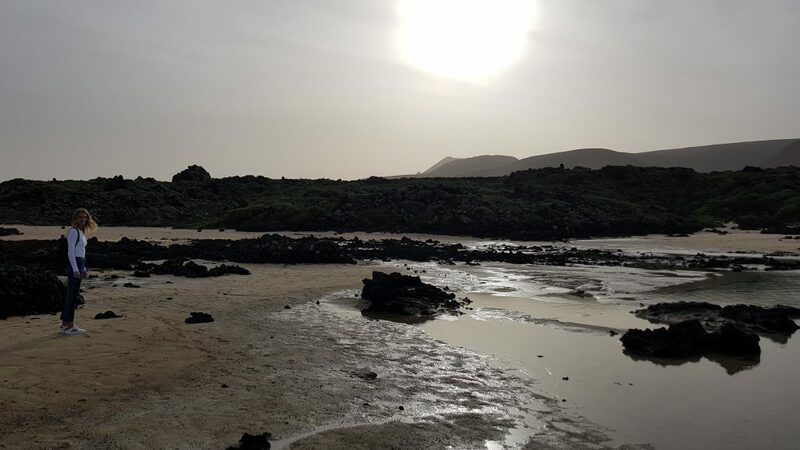 It’s worth to mention that the road leading to Playa de la Cera it’s not a concrete road – it’s a dirt road. 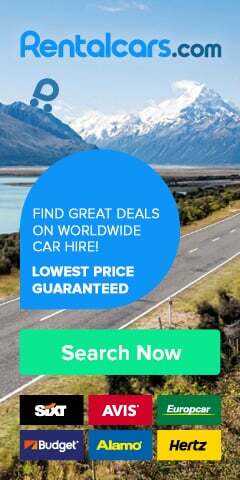 Its condition is pretty good, but it will take you a bit of time to drive to the car park if you didn’t rent out a 4×4 car. 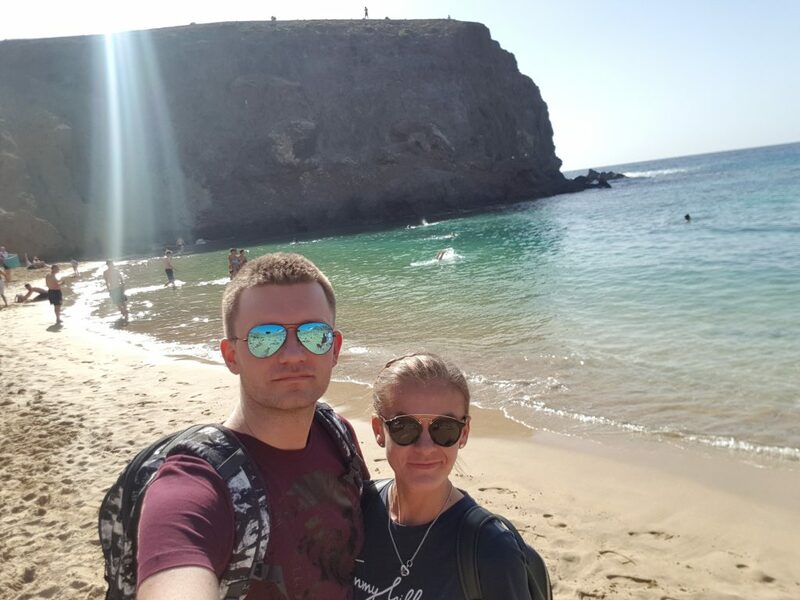 Probably the best beach in Lanzarote and one of the most beautiful European beaches! 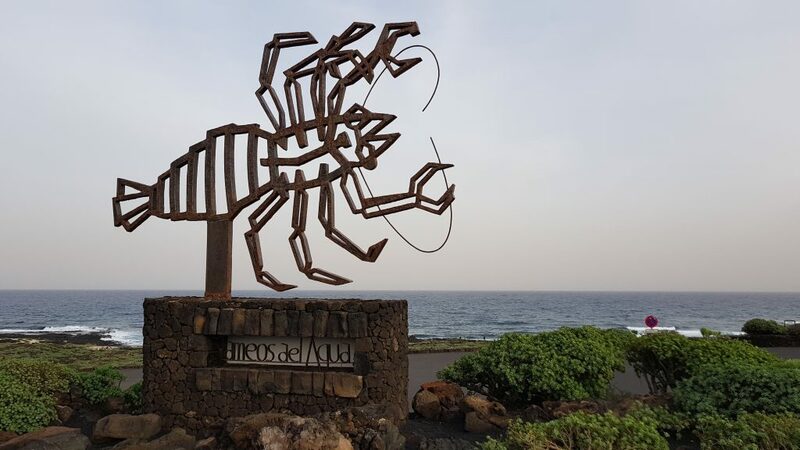 A must see while visiting Lanzarote Island. 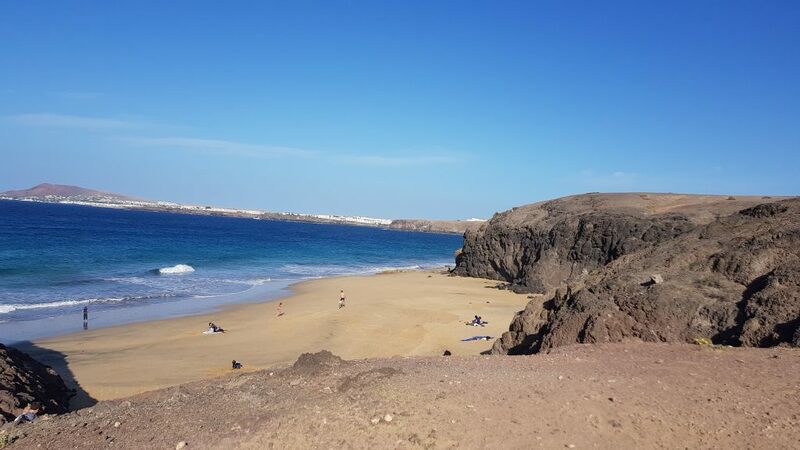 The Papagayo Beach is one of the most advertised attractions on Lanzarote, so it can get crowded very quickly. 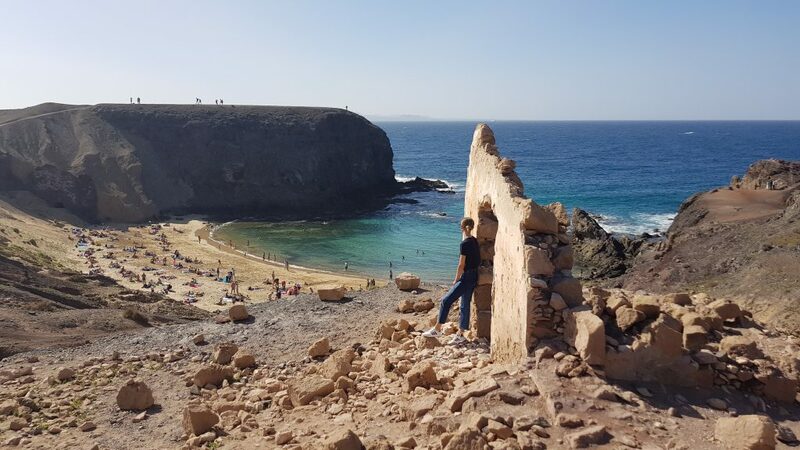 Locals say that it used to be a well-kept secret once upon a time… but these days it’s probably one of the most visited beaches on the Island. There are even some organized boat trips to Papagayo Beach. 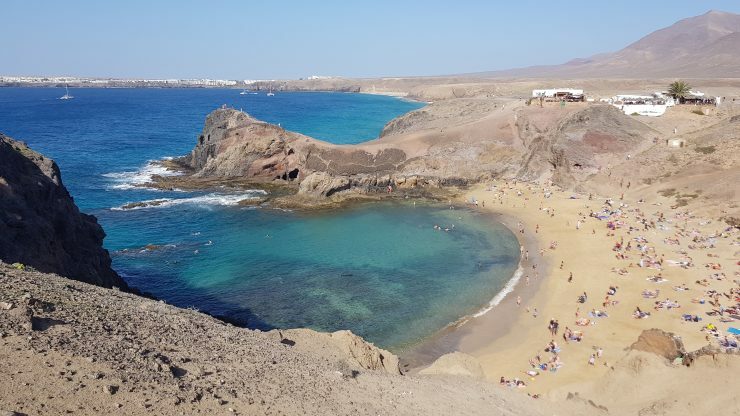 Papagayo is a sheltered beach and it is surrounded by steep cliffs – the setting is really stunning! 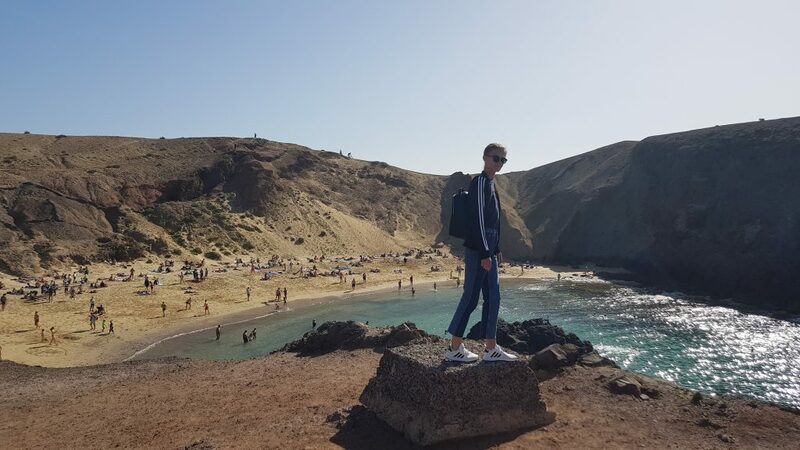 While visiting this beach, make sure to save some time to climb the cliffs. It’s totally worth it! You will be rewarded with spectacular views of all Papagayo beaches. 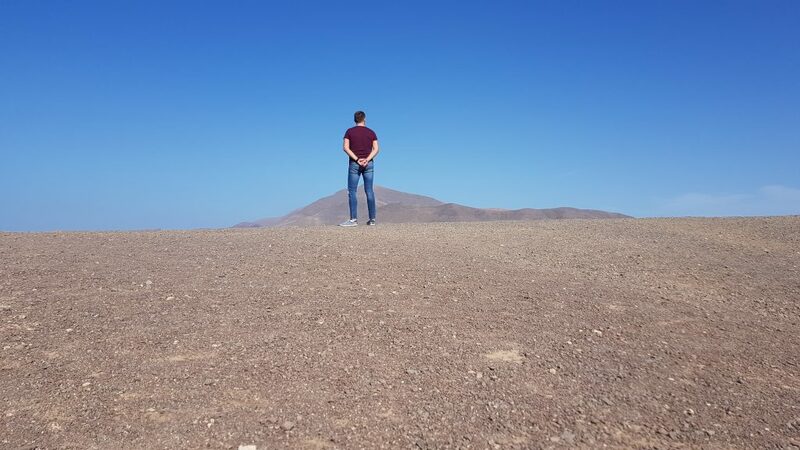 Did you like our list of best things to do in Lanzarote? 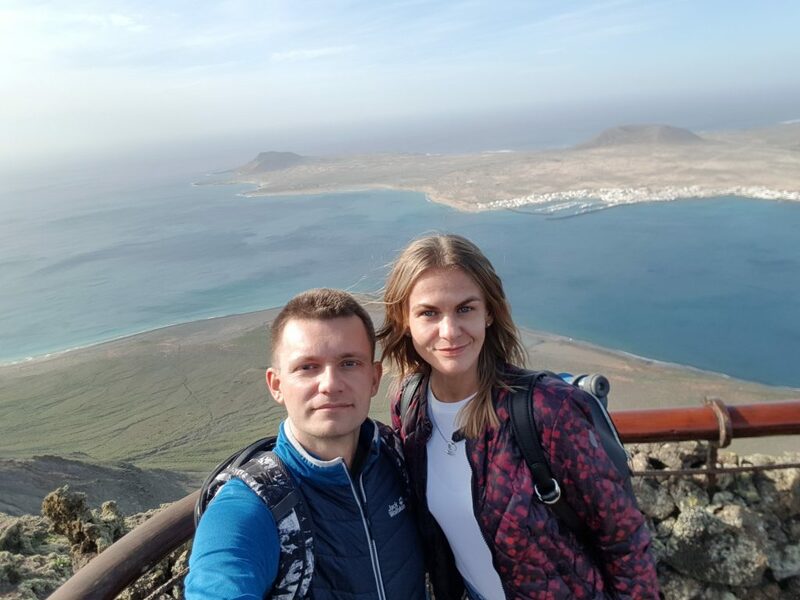 Lanzarote may seem small, but it is interesting enough that it is worth adding it to a bucket list of top holiday destinations. 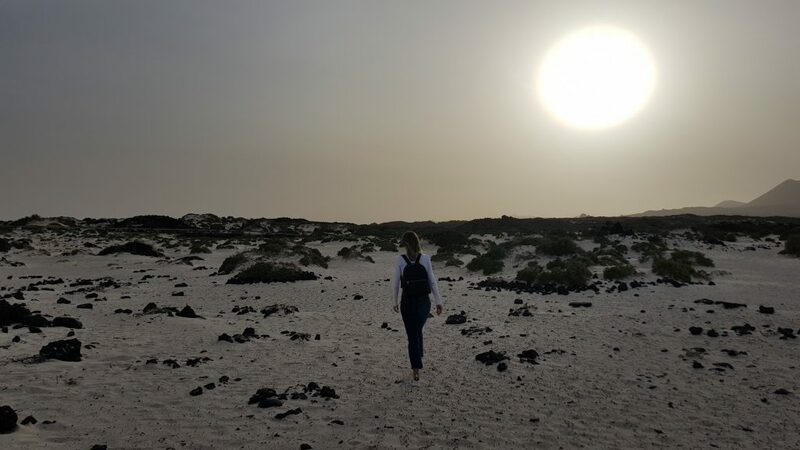 Amazing landscapes like from the Moon, sleepy villages with atmospheric tapas bars and varied coastline with lava-carved cliffs are only a few things among the main attractions on this Canary Island. 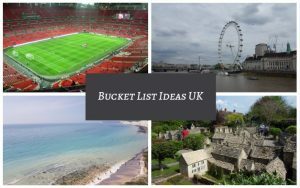 If you add crystal clear water + amazing beaches, in colours from dark graphite to golden-white, then this will become a very attractive holiday destination in Europe. Do you agree? 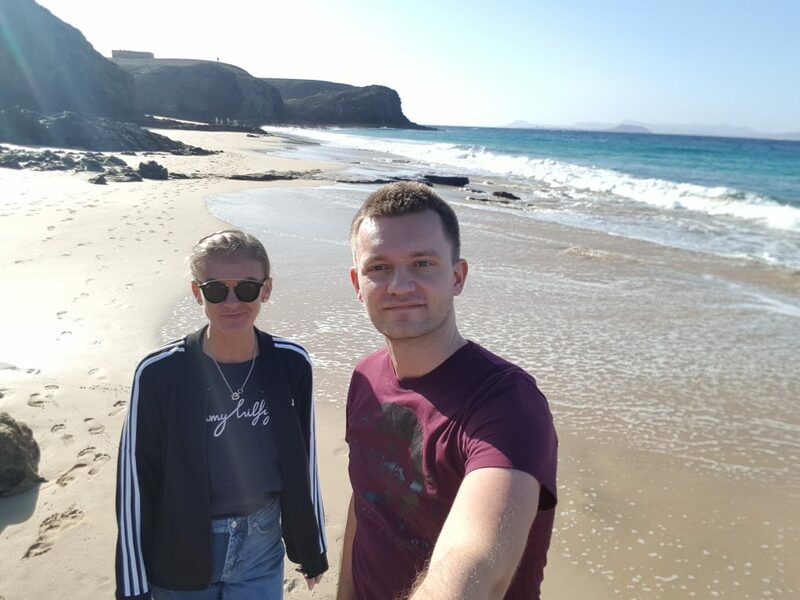 An abundance of beaches with shallow water and a year-round spring climate make Lanzarote one of our favourite destination we have ever visited!